Described by the doyen of British clarinetists, Jack Brymer, as "the finest player of his generation", David Campbell has performed in over 40 countries with leading orchestras and ensembles. Championing contemporary music and the genre of clarinet quintet, he is a dedicated and passionate teacher holding positions as Director of Winds at Canterbury Christ Church University and Head of Woodwind at Westminster School. 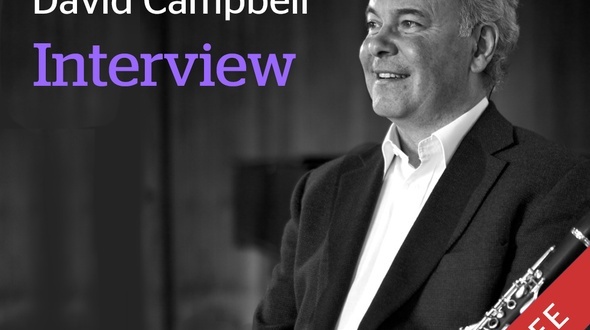 David Campbell shares his life long experience in this 1st masterclass, in a series of masterclasses with one of Great Britains finest musicians. Poulenc Sonata is one of the most popular pieces for clarinet players, and for a good reason! Still it´s´a serious challenge for the one who really wants to play it well. Dave gives you lots of tools to break this piece down and start practicing it in a smart way. David Campbell is internationally recognised as one of Britain's finest musicians and was described by the doyen of British clarinettists, Jack Brymer, as "the finest player of his generation".